And it turned out my excitement over the arrival of this anthology from the UK was warranted. Watcher of the Skies: Poems about Space and Aliens is a fantastic poetry collection for kids - playful and insightful and sure to spark the imagination of young writers and explorers alike. The collection pairs the poems with notes and suggested connections (presumably) supplied by editors Rachel Piercey and Emma Wright, along with related facts by Rachel Cochrane, a PhD student from the University of Edinburgh's Institute for Astronomy. 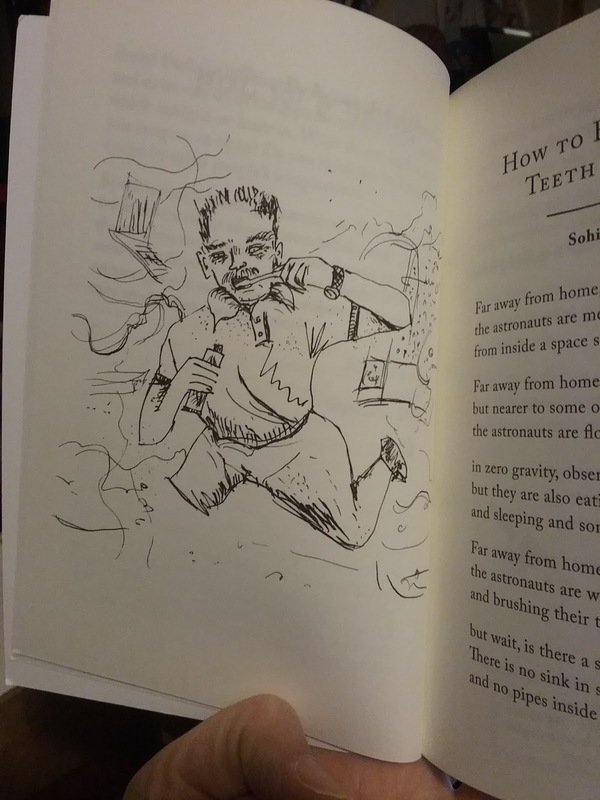 This is a wonderful way to put the book together, as it means the poems can rise to any level of whimsy, with the kid-friendly "footnotes" offering the real-world support. Some of my personal favourites include the crop-circle instructional "Art 101 for Aliens" by Rebecca Colby and the story of Galileo as told in "The Starry Messenger" by John Canfield. Robert Schecter's "Compared to What?" and Dom Conlon's "The Way Planets Talk" both compellingly present big ideas while "Up Above" by Mandy Coe is a beautiful hint at where folklore comes from. 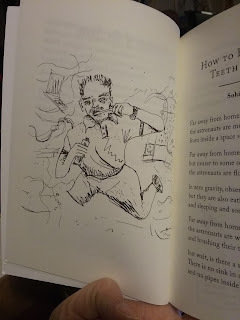 Of course it also helped to win this Canadian over when the first of the lively line drawings done by co-editor Emma Wright was an illustration of Astronaut Chris Hadfield performing the title action for "How to Brush your Teeth in Space" by Sohini Basak (I do hope they sent Commander Hadfield a copy). All of this is to say that I highly recommend this book for kids who have even a hint of space or or sci-fi nerd brewing in their souls, or who just love playful poems. I imagine teachers could make wonderful use of it as well. It's listed as being for ages 8+ and I see no reason to disagree. Some of the vocabulary will certainly challenge some 8 year olds, but what better way to encounter new and exciting words than in an out-of-this-world rhyme? I ordered this directly from the Emma Press website and I recommend visiting to check out their other collections for kids and adults alike. But if you prefer, at time of writing the book is also available through Amazon.ca and through Amazon.com (but don't use those options if you want to get in The Club - or at least send an email first and find out how that would work).